When the heating fails one of the biggest fears is frozen pipes. We’ll get the pipes thawed out and repair any breaks. Got a clogged drain, no problem. Just need new installation, let us handle it. Maybe your uncle Bob swears he knows how to fix the water heater but now it is worse then before, we’ll come sort it out for you (and we won’t tell Uncle Bob). Whatever the problem, let T.H.I. be the answer. Call or email to see about getting a free estimate. 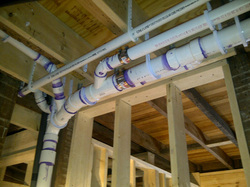 including drainage and new water lines in both copper or PEX. Toilet not draining? Sink backing up? 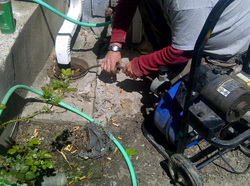 We can snake the lines, clear roots or us a jet to clean the drain. Heating and Plumbing Service and Repair servining Central New York, including Cortland, Chenango, and Broome Counties.